Last night Nigel suggested that we walk all the way to Lukla next day rather than stop for another night at Chutanga in tents. This meant another two hours walking, and it was good that the suggestion came from Nigel as he has found the going tougher than everyone else. The proposal didn't get unanimous support, always a challenge to change a plan, but we agreed to talk about it in the morning. Another night of bad weather, an extra two or three inches of new snow on top of old snow from last Friday seemed to rule out Nigel's option and he suggested we forget about it but, after a discussion with the porter's, Jangbu came back and said that they were happy to go straight to Lukla. 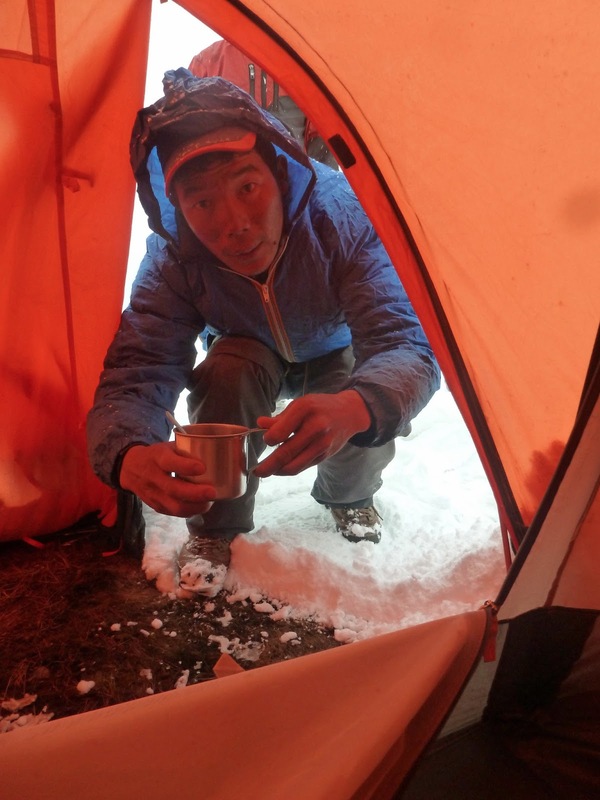 After another cold damp snowy night in tents everyone was keen to make a dash to a tea house's relative comforts. For me a big final day's walk is a much better way to end a trek than a half hearted two hour session. The fact that it was snowing heavily when we started also added a touch of drama, bad snowy weather had defined much of the walk and it was now too late to worry about the views. It's a steep climb out of Thuli Kharka and whole party straggled up the mountain, porters ahead with the main group of trekkers and guides following behind. In addition to the usual suspects there were two sisters from the Tangnag tea house on their back to school in Lukla, and with their constant chatter and giggling you always knew where the main party was. In total there were about 30 people making their way up along a slippery path through almost blinding snow. 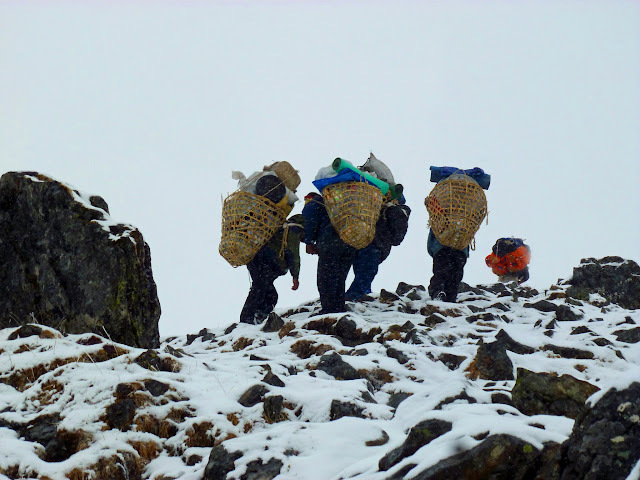 With the porters and their huge loads it felt like we were part of a band of marauders returning from a raid and now in some desperate retreat. The walk was in three parts, a steep slippery climb up and over a pass; a walk along a contouring path to another pass; and finally, a 2000 metre descent into Lukla. 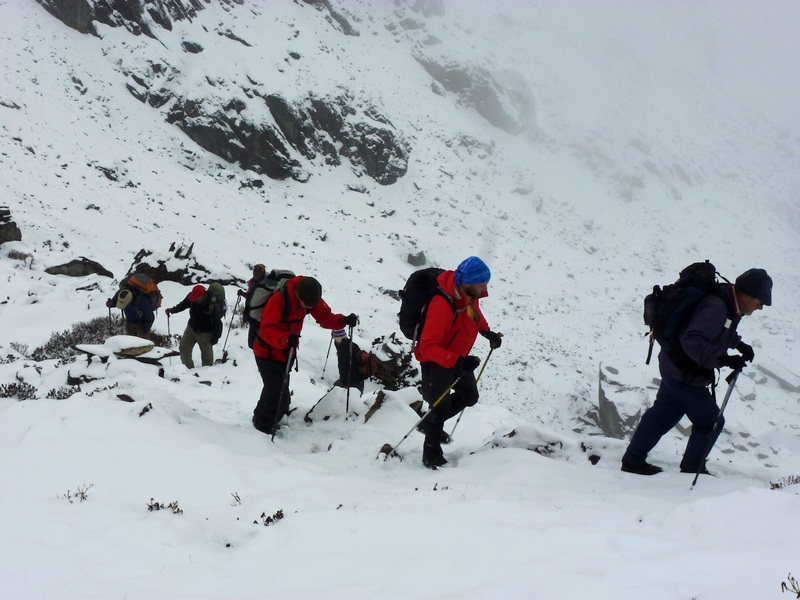 We were walking through snow for all three stages, although it disappeared for the final 700 metres of the descent, and for most of the time it was either snowing or raining. Call me perverse but I enjoyed today's walk as much as any on the trip. Going up and through the blizzard the baggage train stuck together but once we got to top of the first pass the coherence of the group disappeared, with people comfortable about walking downhill in snow racing ahead and leaving the others behind. The path on the contour stretch was very narrow with a sharp drop to the left. For once it had stopped snowing and we could see south all the way into the terraced farming country below. It was now predominantly green with spring arriving since we had left the same farming country two weeks ago. Reassuringly we could hear flights coming into Lukla - the airport wasn't closed. At the second pass the whole group came together again. On the other side was a really steep descent and Lhakpa, our climbing guide who had gone on ahead, had fixed a rope. 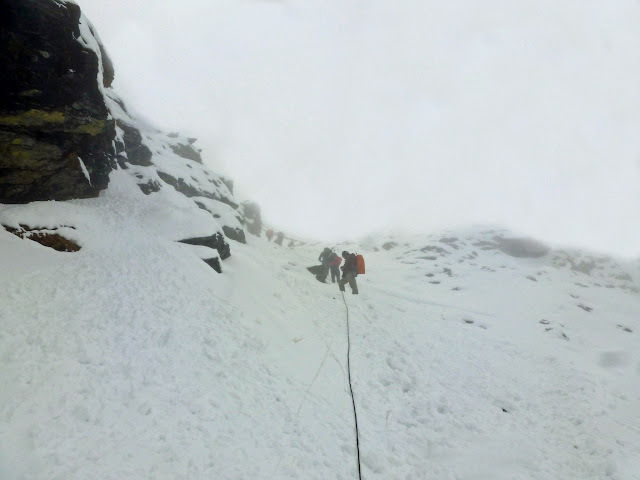 The mist was so thick that, as we descended, we couldn't see the rope's bottom. The split within the group between those who wanted to go fast and those who were a bit more cautious reasserted itself once we crossed the pass. Three of us, Marc the Frenchman from Ipswich, Alistair, myself and Nima the guide charged down the mountain. Don't know why some people have the confidence to go down quickly and others don't, it's not just fitness. I love going downhill fast in the snow. You seem to get to a point when you're almost a passenger, you're feet are working out for themselves where to drop and your arms, with poles at the end, are instinctively stabbing away to get that extra bit of balance. It's just great fun. The rush down the mountain reminded me a bit of the Thorang La where some people had been left without a guide and were just a bit annoyed. This time however it was more controlled, Nima always stayed in front and we stopped twice on the way down to regroup. The "houses" we stopped in were really interesting. A single room with an open clay fire against one wall fuelled by wood fed in at the side. The smoke went up to the roof, a leaky bamboo panelled affair supplemented with bits of plastic. The floor was beaten earth which today was wet from the snow and rain. Rather than a house it felt more like a semi-permanent camp fire surrounded by even less permanent walls - there was no attempt being made to heat the space enclosed by the structure or even to keep it waterproof - and for warmth you just took your turn to sit or squat next to the fire. I guess all this explains what seems to be a complete inability of the Nepalese to shut doors - why bother. The descent immediately after the lunch stop was truly treacherous, very steep, very slippery and even Nima fell over. Still we rushed on and the snow turned to rain. We crossed down into trees and after a tea stop were back in the middle of flowering rhododendrons. We had been listening to the planes flying into and out of Lukla for some time and seeing Lukla was almost like arriving, and the urgency and rush evaporated from our descent. Was able to exchange a text with Christine for the first time in 14 days and once again was connected with home. The dining room at the tea house, full of Welsh sixth-formers from Swansea who had come down from Everest Base Camp, didn't feel the right atmosphere to start our decompression so the three of us retired to the Irish bar around the corner. The only thing Irish about it was hideously overpriced Guinness and we drank cans of San Miguel instead and watched English football on the widescreen television. Step one to coming back. Back to the tea house noisy with the Welsh, and the penultimate dinner from our catering team. Discovered that some of the porters have picked up some more work tomorrow and won't be attending the usual farewell party. Tips are dished out with a beer each, none of the usual ceremonies, and we all feel dreadful about the nature of the relationship we have with the porters, the extreme end of the relationship we have with the whole of Nepal. Will try and do better tomorrow - it really does matter. Well John you just apear as the marauders king. Nepalese adventure finished and hope for a good trip back home again.